It is difficult – if not impossible – for even the science-conscious, thinking citizen to figure out that this decline is happening. The reason for this is that the three avenues through which this citizen could perceive the decline are actually corrupted. The public’s main source of information is the media, and especially, the so-called science reporters. These are actually the touts for the establishment. Whatever line they are being fed, they will run with it. They will report this, get paid, go to Safeway and put food on their table. There is no way that these people are going to be the first to tell you that the quality is declining. Today, almost all of the research in physics is funded by the Government. 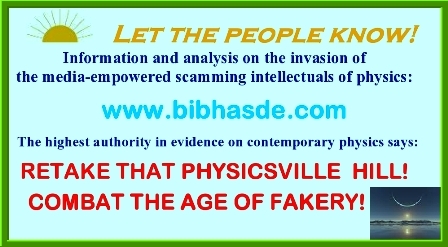 It has set up its own huge bureaucracy to interact with the scientific establishment and administer the funds. This is actually a cozy gravy boat for both parties, and no one is going to rock it. The same is true with the legislative body. They communicate only with the establishment, and ignore any input from outside the establishment. If somehow you, an outsider, can get them to look at a complaint against the establishment, they will consult a member of the establishment. But now there is this blog site! And it is free. Nobody is making money off you by finding a new muckraking issue to write a bestseller about. This is not the kind of blog site where someone snipes from the shady world of Internet anonymity. The author and his bona fides are fully identified. For author information, please click here.